Who is poor in America, and why? Poverty is, of course, relative. The functional American poor have cars, washing machines, and cell phones. Poverty statistics themselves�can be�a snare and a delusion, especially if they are defined�as the bottom whatever-% of the population, as the Brits do. If you use�that method, there will always be a bottom whatever-%, no matter what sort of safety net�is provided through government, and our amazing abundance�of�American�charities, most of which are desperate to find somebody - anybody - to help. In fact, if you declare yourself poor in this neck of the woods, 20 government agencies and 20 charities will descend upon you like vultures - if only to justify their existence. Poverty�in the US�is defined as below a�$20,000 (declared)�income, not by a percentage. I include "declared" in parentheses because there is a heck of�a lot�of black market labor out there where the boss would far rather hand you a pile of bills than put you on the payroll. We all see it, daily, just as well all see folks who will only�accept cash. Is "poverty" a useful concept at all, nowadays? I wonder. Or is it like "global warming" - just a handy�excuse to expand government and entitlements? Tools for politicians? What rankles me is that American poverty figures are driven by political agendas rather than by truth-seeking. Thus American poverty can include recent high school grads in their first job living at home. Or grad students, or hippies living off the land in northern California. Or addicts who don't get to work. Or crusty Appalachian hill-dwellers who don't�like to come down to town to work (the original hippies), but poach, grow some stuff, make a little 'shine, and send the wife to town�for the monthly check. Or other sorts of voluntarily poor such as those who won't move to where the jobs are, or rural and inner-city single�17 year-old moms with four kids. Or those whose second jobs are paid under the table.�Or an unmarried couple where the partner works part-time at WalMart. The icing on the cake, though, is that American�income figures do not include any government or charitable transfers, grants (welfare, Social Security Disability, unemployment checks, etc), housing subsides or the value of subsidized housing, or other benefits such as food stamps, child care,�and Medicaid. If that money is not included, there is nothing government can do to change the numbers. Our moral and mental development, and the high productivity that accompanies it, have taken place under a system of decentralized capitalism. I would claim that the capitalist system accounts for more than 100 percent of the reduction in poverty that has taken place over the past hundred years. How can capitalism account for more than 100 percent of the reduction in poverty? Is that mathematically possible? If we take into account the factors that have retarded poverty reduction, then we can argue that, by overcoming those factors, capitalism accounts for even more than 100 percent of poverty reduction. That is, if world poverty has fallen from 90 percent to 20 percent over the past 200 years, then capitalism would have reduced it by even more were it not for the retarding factors. Ironically, the biggest factor retarding the capitalist solution to poverty may well be the crusade to end poverty using conscious planning. Certainly if one includes among the planned solutions to poverty the experiment with Communism (and I see no reason why it ought to be excluded), then the case against intentional anti-poverty efforts is rather compelling. Simply compare poverty in North Korea with that in South Korea, for example. Kling is probably correct about the world in general, but, in the US, I doubt that applies because we are already a wealthy nation with plenty of jobs and no meaningful unemployment. You have to know there is work for everyone when my supermarket now has�folks with Down's Syndrome doing shelving and bagging - which I think is wonderful. But first, I want to know who the poor are, and what they own, and what they do all day. I am not hard-hearted, but I am hard-headed. My guess is that the truly�American poor are mainly emotionally or physically disabled, dysfunctional, or exploitative and sociopathic - or the voluntarily poor (which includes new immigrants)�or temporarily poor -�and thus unlikely to benefit much�from any kind of�job growth. Please correct me if I am wrong about any of this. Bruce Kesler of Democracy Project was kind enough to send some readings explaining how poverty has been dealt with�in the US. 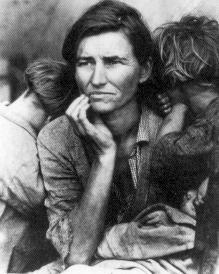 Photo: Dorothea Lange's Migrant Mother (1936) during the Dust Bowl years. This 37 year-old mother of 7 would be�benefitting from much help today,�if her pride would permit her to accept it. I think you nailed it by asking who/what is poor? It is relative. I know most in my church would consider my sister and her husband + 3 kids, poor. They both work, she is a self-employed dog groomer, he works as he can ( he is a bit unmotivated). They have 3 cars, two ATVs, a house they are paying for, 5 acres of land, nice clothes, plenty of food, two cell phones and a good time most of the time. The kids do well in school and are active in all kinds of extra curriculars. They get money back for taxes they did not pay and assistance for the kids when my brother in law quits his next job. I think most studies would count them as poor. In my experience, their way of life is not poor in any but one measure. Thanks for bringing his to the web page. "Well, it�s very simple: they can all point the finger to themselves. They are all to blame, as is their socialist ideology. Socialism has had its day; socialism has brought moral decline, high unemployment rates, weak, unstable economies, huge governments, regulation in just about every area of one�s life; it has caused something called personal responsibility to disappear; it has brought moral relativism; it has learned us that we cannot be proud of our respective country; it has made large groups of people unnecessarily dependent on the government; it has forced us to accept the failed concept of multiculturalism; it has taught us (I mean Europeans in general with that) that whatever you do, you have to be politically correct; it has created an environment in which one is not allowed to name problems, let alone deal with them; it has taught us that criminals are not to blame for their crimes, society as a whole is and that they, therefore, should be coddled instead of punished� oef, the list goes on and on. Socialism has weakened France, and Europe as a whole; it is time to get rid of it." I've been reading a book on women in the west, a book with some wonderful pictures of sod shanties, etc. One of the women came out with the Mormon exodus using a handcart. She mentions them running out of flour and washing out the flour sacks to get enough flour to make gravy so they had something to eat. She also talks about how she did not have thread and had to unravel a shirt for that. When you think about how truly poor people live, I think you realize that we don't have a lot of those in this country. We have people who are suffering and surely those who are poor RELATIVE to most folks. But they are not poor in the way that most poor people live in this world. i a'm not a gronup but i just want to tell you this i feel bad for the poor pepol i'm glad i'm not one of them. when i grou up i will be one of the ones that make food for the poor enywase i'm 5 1\2 yrs old. Materially speaking, there are few if any truly impoverished people in the US, but spiritually speaking, there is much poverty of which government programs can only make worse. As a dutch friend of mine once remarked, "...we don't have real problems, we have problems of luxury". Well that was before the emergence of an aggressive non assimilated muslim population. A few years ago, I read about a guy in India who wanted to come to America. His main reason was that he wanted to see a country where poor people were obese, rather than starving or dead. Thanks for your thoughts and links. If anyone can find stats on who the poor in the US really are, as people and not just as numbers, I would be very interested. Some are surely those sho have had grievous misfortune, and many for whom it is a temporary condition. I recommend "The Working Poor," by David K. Shipler, and "The Two Income Trap," by Elizabeth Warren and Amelia Warren Tyagi. Both books are are chalk full of stats with footnote sources. It is hard to get the stats. For example, we don't really know how many able-bodied Americans are actually unemployed. Unemployment statistics are only for people still collecting benefits, I believe. Once they run out, the person vanishes as a statistic. I suspect that alcoholism and other addictions, and untreated mental illness, are a big piece of who is poor in our country. But part of the story is the pyramid structure of much in the American workplace. Up or out by age 40. At one point, on my suburban block alone there were four men over 40 and under 50 with paid off houses, families, graduate degrees, all formerly successful on the Street, and all laid off. Unemployed year after year, unable to find work in their field because they were too old and perceived to be overqualified as they set their sights lower and lower. Eventually they gave up, and sent their wives out to work. The women, all professionals in their own right before they gave careers up to be full time moms, had no trouble at all finding clerical jobs way beneath their former employment. For the last decade they have kept the basic bills paid and the families going. The marriages are frozen, the families are locked in conflict, and the spiritual effects of the waste of able bodied, talented males unable to find work in their field is staggering. Two wasted their family's remaining savings on fruitless scam franchise "opportunities." Small businesses fail at an obscenely high rate. None of these families are "poor" materially but they have disintegrated emotionally. One of the men went mad shortly after his long suffering breadwinner wife died of breast cancer (she worked until a couple of days before she died because without her job, there would be no health insurance for her care). Another is now alone, battling cancer. Another cowers in the house all day, afraid of being seen outside "during business hours" while his wife works fulltime and drives the kids and avoids him. Another moved South and started another franchise, and it has apparently folded. The boss of one of them in their former firm on the Street eventually got a job partime selling electronics at a big box store with the 18 year old kids. After a few months he killed himself. The other men on the street? Those working men exemplifying the creative spirit of American capitalism to my children, who are hungry for role models? The owner of a local bar, who went to AA and sold his business obviously. A car salesman. A schoolteacher. A retired engineer. A divorce lawyer. Some new financial type. A wimpy househusband, whose formerly high flying professional wife is now unemployed and droopy looking at home all day. A mercenary soldier who is the only cool guy in the neighborhood and who delights the neighborhood kids and appals the yoga set of mommies. My children want nothing to do with business, banking, the law. What they have learned from living their whole lives in this suburb is that Mammon chews up and spits out bright, hardworking people. No point in trying to get rich as you will likely fail, and do so in the company of greedy jerks. Better to just do what you love,something that helps others. The people they admire are doctors and soldiers and sailors and ministers, writers, artists, musicians, some academics and schoolteachers. It's interesting that you choose Maine as an erroneous example of poverty in America, because after reading that Maine was one of our poorest states in the 1970's, I did some personal comparisons. I was single making almost double what the average family in Maine made but I was living near NYC. After adding up my costs: car payments, rent, etc. in a high cost area, I had vitually nothing left over. In Maine, as you say in your article, everything is paid for and any income they had was spendable income. This was one of those realisations that helped to burst my liberal bubble. I think you hit the nail on the head Barrister. Poverty is in illusory gambit used by the power elite for whatever purpose that suits them. Charles Murray, in an essay in National Review many years ago asked "What's so bad about being poor?" The question was to be answered specifically. He asked whether the life of the folks in the dreadful Bronx housing projects was superior to that of the Thai peasant. In the first case, the family was backed up by $30k to $50k in cash, kind, and services on the sole condition they not get caught committing honest employment. The Thai peasants worked their butts off and had, at most, $100 left over. But Murray, who apparently did field work there or for some reason is familiar with it, made the choice obvious. The Thais had it better. And the difference was not material. I wrote to Murray suggesting he compare the Bronx projects with the Ingalls family in the series of books known collectively as "Little House on The Prarie". Did you ever think of the Ingalls family as poor? Why not? Compared to today's poor, what did they have? That question gets people looking puzzled. I should say that Murray very kindly replied and said he appreciated the suggestion. More Americans know of the Ingalls than of Thais. Yes - that is why I wonder whether "poverty" is a useful concept. Are Africans, living native-style in the jungle, poor? The Ingalls family poor! No way. And rich as Croesus in spirit. The Census Bureau has, for many years, published an annual report on Poverty in America. It generally comes out in August. I blog about it every year. The report provides a wealth of historical data. Curiously, that data seems to generally indicate that Americans are better off at the present time than ever before. Here's the analysis of the last report. This is really an outstanding post, B. A saver--will help in many a discussion yet to come. Thank you for the compliment, Buddy. I think what this piece really does is to ask questions, but what is sort-of new about it is the idea of the voluntarily poor. They exist. I've known them and seen them all over the country. Not everybody is primarily motivated by wealth-seeking. So true, B. Despite my at-times snarky comments about captains of industry, I so admired my dad who, after a long career in finance, built a world wide company of his own, all the while living frugally himself on less money than one of his lower managers. I am rather rueful at times that not a one of my kids has the slightest interest in making money. "But who will support me in my old age?" I tease. They are not trust fund altruists: all will have to work hard for their bread, with just education paid for. What motivates my kids to seek to work at what they love or what helps others is not the narcissism that has been so castigated in their generation (and ours), but rather the family history: their father's career being ended when, as an honest man, he refused to obey dishonest orders from bosses. If this happens once, you can attribute it to an occasional bad apples. But several times, and it scares the kiddies away from financial professions. They are, fortunately, fairly impressed by the family friends who are small business owners, and think their entrepreneurial grandfather was cool. They particularly llike that he would say f#$% unions, but would give up his own vacation to help out and give an employee the money in a family crisis, and that he paid for workers' educations, etc. One of the toughest questions in life, i think, churchmouse: "How to steer the kids?" The first question, fraught with unknowable ramifications, is "hands-on, or hands-off?" My results come in in trickles, mixed, dependant upon how satisfied the now-young adults are with their jobs. My regret is that two liberal-arts daughters now wish (wistfully, not actively) that they'd gone into hard science. But at the time, they were enraptured in their majors, and who wanted to throw cold water on their passions? Question: "How do you end a conversation with an Anthropologist (or, whatever)?" Answer: "Pay for the pizza." Medicine, biology, academics. But all are cursed with being good writers and wanting to express themselves, so I see beans and rice and great poverty in their future. We are all frugal so this is no big deal until they have kids! They will ignore me anyway! Right now, none of them want to ever have a family as they see how my life has worn me down. The girls would be great mothers, but they don't want to trust their lives to the selfish boys of their generation. But I think they will get more optimistic once mommy the beast of burden is no longer nearby. One of these days they will meet a happy traditional family and dare to hope for one themselves! I've managed to draw my advice (whenever one of 'em is unhappy with where they are currently located, either physically, or career, or life-wise) down to "Well, everybody gotta be *somewhere*." Parental advice in a perverse way gives a kid a difficult situation--that the kid can both be a 'good' kid by listening to parent, and yet shift any blame for results that aren't perfect (and results never are perfect) back onto parent. Touchy relationship, between what seems right and what may be dangerous. If only that first decade of adulthood wasn't so critical. You have to be an expert before you have any practice. So true, BL! I'm still so immature, I'm hardcly one to give the right advice! Just can't resist variants of England expects every man to do his duty. As long as they serve God, country and love their family, they will be rich indeed. And I a proud mama. Back to my oar [in galley slave mode with half a cut coworker's job added to mine]. Efficiency, sighs my overseer in satisfaction! Ah, the oar...always the oar...(groan). But, post-script, "arms-length" hasn't exempted me from the "bad-advice" charge--it has merely adjusted the bill of particulars to "dad is just too lassez-faire". Poverty...or rather what is richnes. Gratitude is riches is what my mother always told us growing up and working on the family farm in Houlton Maine. We have what we need...its the nation's desire to have what they think they want that causes the lack of joy and anxiety! Consider it all joy! Good honest independent working on the farm where you can see what your day's labor accomplished. Sleep well, eat well and contented to be doing an honest day of work raising children with a work ethic..with a desire to work hard and to know how to enjoy labor. "Kling is probably correct about the world in general, but, in the US, I doubt that applies because we are already a wealthy nation with plenty of jobs and no meaningful unemployment. You have to know there is work for everyone when my supermarket now has folks with Down's Syndrome doing shelving and bagging - which I think is wonderful." Overall I am very impressed by the article's assessments of poverty in the USA. I haven't read a more concise reading on the subject anywhere. However, I do not agree the answer to be any form of socialism or communism. Nor do I believe a person to have egotistical pride for refusing welfare programs. The statement quoted above, I believe to be a great source of misinformation. The employment of the handicapped does not signify there being work for everyone. It only signifies another program being held in place by the present economic trend. The USA has not discovered how to participate in a global economy without sacrificing the well being of American workers. It has listened and obeyed greed over true need. Education is the answer to wealth, health, and prosperity. That is why America has educated the world and the world desires to be in America and buy it out. We are not learning and our children are being raised to be system slaves rather than free citizens.